I finally joined the sunburst mirror party...and I’m only about 2 years late. Better late than never? 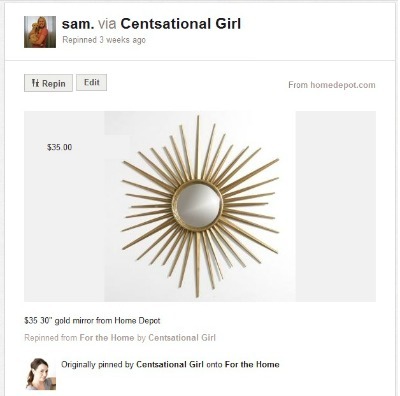 A sunburst mirror for $30 and it’s available at my local Home Depot? SOLD! Anyway, the gold finish ain’t my thang, but before I changed anything I wanted to make sure that I really liked the mirror and that it fit the space. If it didn’t work out, it would be pretty impossible to return a spray painted mirror. I loved it, so it was spray paint time! A couple coats of Rustoleum Metallic Paint/Primer in Satin Nickel later and I had a whole new mirror. I let it cure in the garage for a couple days so we wouldn’t have spray paint fumes in the bedroom. I hated having to wait, but now it’s hung and I love it! 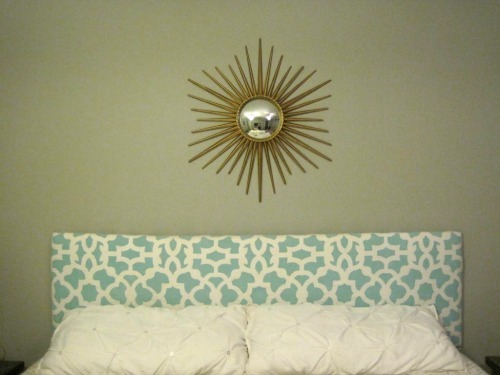 I still need throw pillows and want new lamps, but the mirror makes the room look a lot more finished. 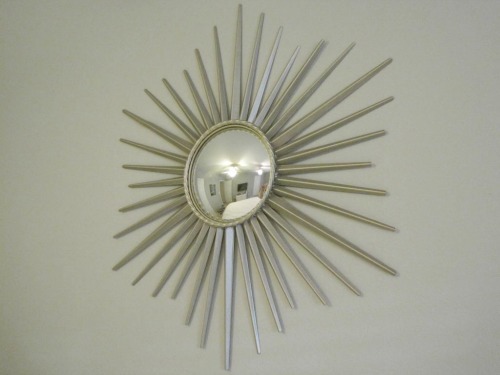 OK, who else has a sunburst mirror and how long have you had it for? I remember seeing them all over the blogs a couple years ago, so as usual, I’m way behind on a trend. 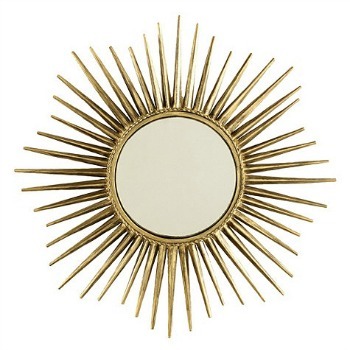 Although, I think the sunburst can be classic and not just trendy. It's so pretty and I love it in that color!!! I'm like you; I'm usually behind on the trends. I just don't have the money to run out and buy stuff as soon as it comes out so I have to wait and plan out my purchases more. 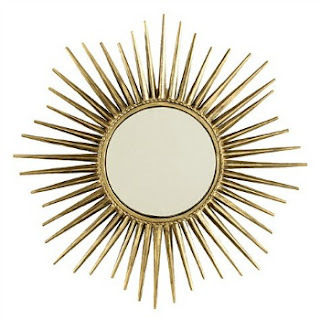 But I totally agree that a sunburst mirror is a classic look that looks good anytime, even when it's not the latest thing. 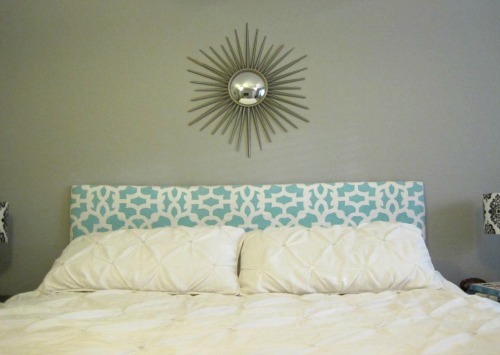 Things that work that well in any room never go out of style! 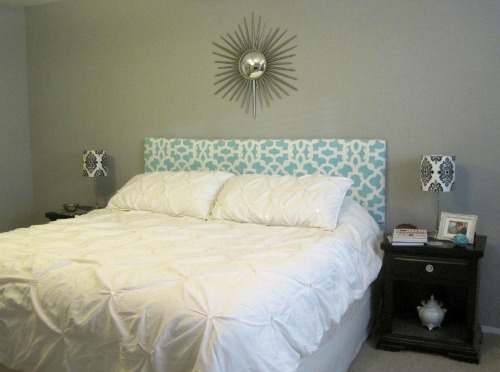 I LOVE the headboard too btw!! Sam, it's perfect. I love that you sprayed it to fit your room. Beautiful! And what a great color. $30 is such a great deal! Much more into silver/platinum/nickel tones than gold. So this is a work of art in my eyes!